Up until the twelfth century, the episcopal and imperial powers alternated in the rule of Asti. In 1275, the Emperor Henry VII donated the city to Amedo V of Savoy. In 1387, Gian Galeazzo Visconti, lord of the city, gave it as dowry to his daughter when she married Louis d’Orleans. After the fall of the Orleans family in 1415, Asti returned to French dominion. In 1512, it passed to the Sforzas and in 1531 the city fell under the rule of Charles V. In 1575 the Spaniards returned it to Savoy, trying to rimpossessarsene in the first war of succession of Monferrato. In the seventeenth and eighteenth centuries, the city continued to be contended, eventually returning under the Savoys in 1815. The first document mentioning Jews is dated 812, but it is unclear whether it refers to Jews who lived in the city or to travelers. It was not until the 14th century, that some Jewish families from France settled in Asti and created a community. Documentary evidence of the Jewish presence in Asti dates mostly to the 15th century, indicating that several Jewish families resided and conducted business in the city at the time. Following the plague in Alexandria, the city council asked the Duke of Orleans to expel the Jews from the city and the surrounding area. The request was rejected and they remained with the obligation, however, to wear a recognition sign. In 1515, the brothers Clement and Solomon, the sons of Moses, were granted permission to reside in Asti together with their partner, benefiting from the same chapters and privileges that Maximilian Sforza had granted to the Jews in the rest of his dominions. However, in 1535 the duchess Beatrice of Savoy issued an order to expel the Jews from Asti. However, in December of the same year two letters of license were released to Jacob, Elijah and Joseph de Sacerdote, allowing them to remain in town for another six months as long as they agreed to wear the distinctive white and red sign. In 1538, with the death of the Duchess Beatrice, Jews were granted reentry to the city by the Duchess’ son, Emanuele Filiberto. In 1539, Elijah Segre, his brothers, and his grandson, Jacob Foa, were granted permission to live in the city. In 1589, the Apostolic Nuncio in Turin filed a complaint with the Pope against the civil authorities of Asti, claiming they had defended the Jews during the book burning campaign launched by Papal authorities throughout Piedmont. In 1538, Emanuele Filiberto granted the Jews the right to return and settle in Asti and establish money-lending businesses, exempting them from the use of any sign. The Duke granted Isaac, Jacob and Elijah Poggetto Foa permission to reside for a year and to open their banks. These banks were a substantial source of income for the sovereign, who demanded fees to grant the licenses’ renewal. Local rulers acquired power through the activity of the banks and demanded increasing contributions from their owners. At the end of the 16th century, Asti’s bankers carried great financial power within and without the Savoy territories. By 1603, the Puget Lazzarino heirs and Elijah from Nice led the two banks of Asti. In 1605, these banks were divided into two and conducted separately by brothers Samson and Lazzarino. The last banking license is dated to 1624 and concerns four groups managed by Moses Jarach, Emanuele Artom, Giacob Poggetto and Israel Lattes. The Royal Constitutions of 1723 and 1729 established the creation of separate quarters for the Jews in all the Savoy dominions. The Jews from Asti lived in one quarter which, in 1730, became a place of mandatory segregation. The social composition was similar to that of other communities: a small number of wealthy bankers and merchants and a majority of second-hand sellers, street vendors, artisans and beggars. The leaders of the University of the Jews (Jewish Community) were exempt from taxes that each community member had to pay to the state, depending on the assets they held. Access gates to the ghetto were at the two ends of the Contrada of the Jews, the present Via Alberti. The Napoleonic decrees of December 1798 and February 1799 made the Jews equal to other citizens, abolishing the ghetto both in physical limitations as well as in administrative autonomy. The privileges granted by Emanuele Filiberto to the Jewish Community of Asti in 1538 were different from those enjoyed by the Jews in the rest of the Savoy domains. The ducal concessions established that internal civil disputes had to be resolved by two Jewish judges. The Jews also could not be called to any public service on Jewish holy days holidays, nor could any ecclesiastical or civil authority call upon them for any reason during religious services, which were held at home or in the temple. Additionally, they had a right to their own cemetery. Jews were not required to wear a distinctive sign and when they fled the city, due to war or pestilence, they had permission to return. Each community of the Savoy territory was administrated by a “Conservatore”. In Asti, the communities were able to also appoint two judges (Pretori). In 1565, all privileges were reconfirmed, most notably the freedom of worship; the use of a temples, cemeteries, and sacred books; and a kosher butcher. Asti Jews were protected from abuse and harassment. Legal value was attributed to their general assemblies, directed by Jewish leaders, and meant to provide for the Community’s internal needs and the money to meet financial obligations to the Duke. Internal religious disputes were entrusted to a court of two rabbis. Religious life was lively. The tradition followed by most Piedmontese Jews is known as “Apam” (or, more exactly, “AFAM”), which comes from the Hebrew initials of the three cities in which it was practiced: Asti, Fossano and Moncalvo. They spoke Judeo-Piedmontese composed of local dialects and Italianised Hebrew words. On the occasion of the holiday of Purim, it was customary for the Jews of nearby communities to go to Asti for the masked ball. In 1761, approximately 196 Jews (38 families) lived in Asti. By 1774, the number had risen to 400. In 1791, with the arrival of the French, the Jews became equal citizens in all respects, and in 1797, the gates of the ghetto were abated. In 1810, the new cemetery was inaugurated. During the Restoration of 1815, the old anti-Jewish restrictions were reinstated for a short time. The Jewish community was granted total emancipation after the promulgation of the Albertine Statute in 1848. After emancipation, 267 Jews lived in Asti. In 1889, the old synagogue was renovated with the expansion of the women’s gallery and windows. Jews were well integrated into the 19th century’s local society. 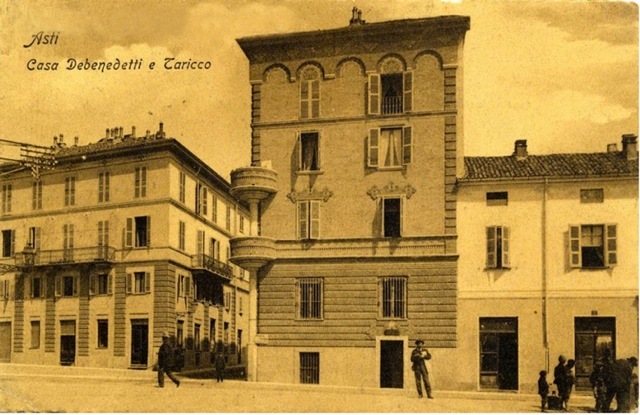 Senator Isaac Artom was the secretary of Camillo Benso di Cavour and Zaccaria Ottolenghi, who built and financed the Teatro Alfieri, as well as a city counselor. Even today streets and commemorative plaques carry the names of De Benedetti, Clava, Treves, and Levi-Montalcini. In the 20th century, the Fascist regime forced the centralization of Jewish communities and annexed small communities to the main ones. Thirty Jews who had remained in Asti were deported. Three returned. Today the community exists only as a section of the Jewish community of Turin.